I love round mirrors. 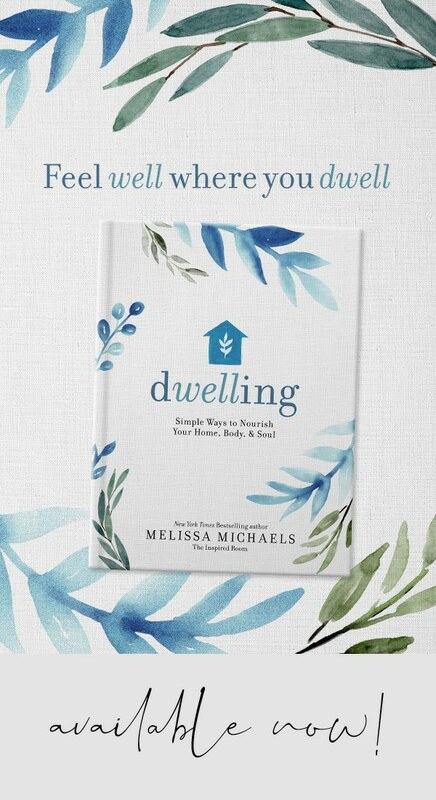 Maybe it is because so many things in a house are typically square or rectangle. A little bit of roundness softens things up and gives a room more interest. I recently added this huge quirky and fun round wood ship portal style mirror to our kitchen. It makes such a big fantastic statement! I’m IN LOVE! It is so whimsical and full of rustic texture, I’m digging the jolt of personality it brings to the room. It is just such a uniquely interpreted piece, and a fun cross between a typical modern sunburst mirror and a coastal portal mirror, I love it even more than I imagined! At first I was scared that it would overwhelm the room and call too much attention to itself, but it ended up being a great statement piece. Sometimes we go way too small, safe or predictable when it comes to accessories or things on the wall! One nice big unique statement piece in a room can make a real impact. The rustic wood plays off the wood floors and contrasts with the sleekness of the white quartz counters. And the round shape is absolutely perfect for finishing off a room with many rectangles. I’d show you more of this cute corner in the kitchen, but it is almost time for the whole kitchen reveal (you can see the kitchen cabinet colors here) and I need to save some angles for that big day. Right? Heh heh heh. Sorry! But I do have some adorable new light fixtures I want to show you before the big reveal, so stay tuned on that. 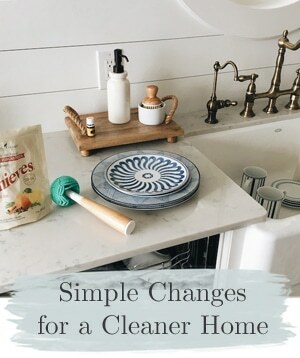 You’ve all waited so patiently through my kitchen updating and I’m trying to show you each new addition I make along the way, but you’ll see how the whole room comes together very soon. Seeing the whole space will give you a much better idea of how the room feels and relates to the style as a whole, as my goal is not to create just a pretty corner for a photo, but an entire home that flows well and feels good to be in from all angles! Oh, and back to talking about round mirrors (cause I like to jump around like that in conversations), this past year I got a couple of other new round mirrors. One is the round mirror you’ve seen above my bed. 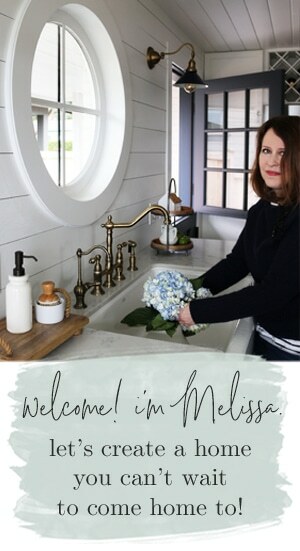 And, I just added another round mirror I adore to our powder room, which I will reveal to you in the powder room makeover post in the next day or so! The room turned out so cute! I’m SO excited to have it DONE! Also? I’m pretty happy to see tulips again. Aren’t you? Spring IS on its way. 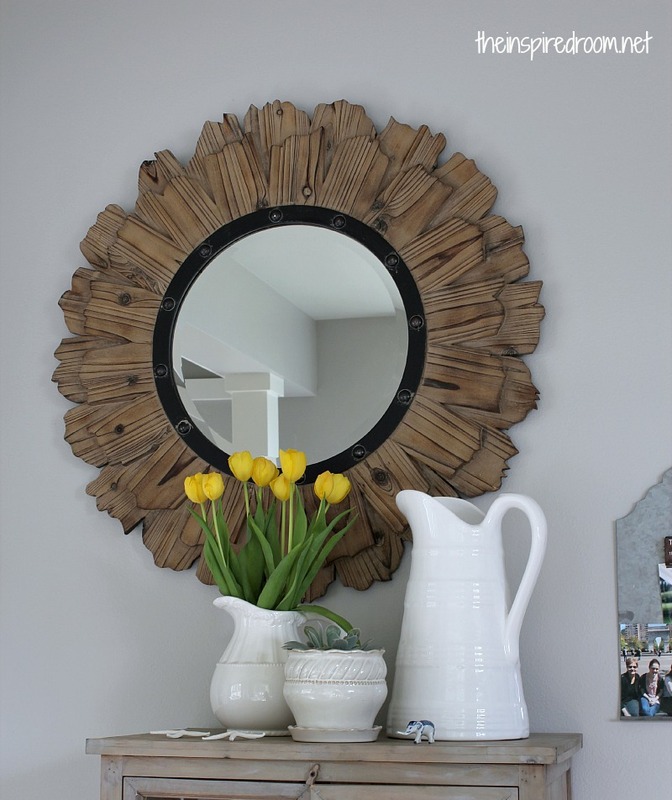 The awesome rustic round wood mirror in this post is from a fun little home decor shop called Lulu & Georgia. You can shop with them online, yippee! This mirror was provided to The Inspired Room in exchange for the blog mention, but as always my opinions and decorating style and choices are my own. Ooh, you leave me wanting more, more, more! Can’t wait for the whole reveal! And you are spot on about wimping out by going too small or safe. Glad you had the guts to go for it. It looks fab! Such a beautiful mirror. 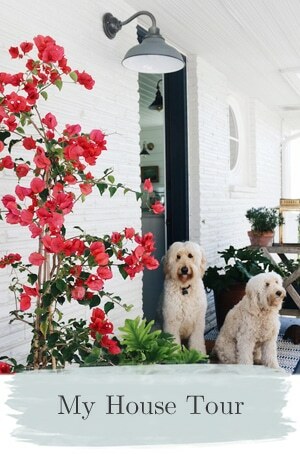 Love the coloring with all your shades of white. Anxiously waiting the entire kitchen reveal! I am finalizing my kitchen plans this Friday. So excited! I decided on white counters as well and can’t wait to see your entire kitchen. Thanks for sharing. Yes, there’s something about round mirrors. I’ve got three of my own but none are large enough to make a statement like yours. Love it! I just love mirrors period, this one is very pretty and rustic. I love the pottery underneath. What a lovely mirror! It looks great. Oh, I love it!!! I am in love with rustic wood! I would so love to recreate something like this if I could! Can’t wait to see your entire kitchen! You are absolutely correct…most people put too many small things on the wall. Your mirror is just charming!! Love that. Can’t wait to see the reveal!! I love the contrast! I’m trying to achieve somewhat, sorta the same spring look but I need to purchase some white containers. 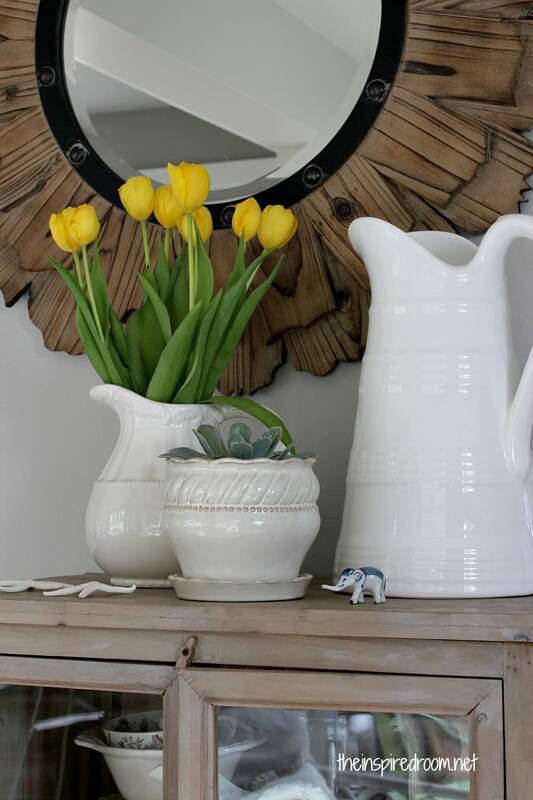 I might have to get crafty and lean towards a cottage look since the beautiful white vases are something to invest into my budget. I love this look! Those yellow tulips really contrast wonderfully with the white and brown. I LOVE this. The mirror is awesome, but I genuinely feel my favorite part and the thing I most adore is the tiny elephant. 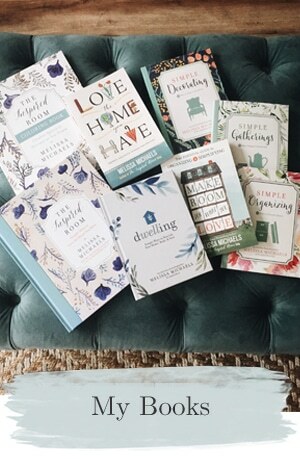 By reading so many wonderful home decor bloggers, I am beginning to have the courage to place something that doesn’t “fit” in conventional terms to the spaces I work on. Love the mirror! – could be perfect for my dining area too. Where’s you buy it? Thanks, there is a link at the bottom of the post and in the post that goes right to where you can buy it! Hope that helps. Thanks Michaela! We are really happy with it!! I love this mirror. So rustic and still so clean looking. Can’t wait for the big reveal! I think, I wanted to get that wood mirror too but not for my kitchen. 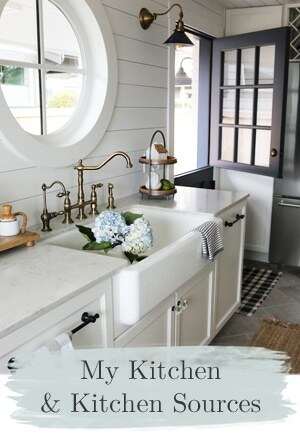 And when is this big day coming….my kitchen remodel is just a few days away and I was sure hoping to see your island before I give the “full steam ahead” to my remodel guys!! !